Sunlight dapples through dew-kissed dogwoods and magnolias, gently awakening the Port City from its gray wintery slumber. 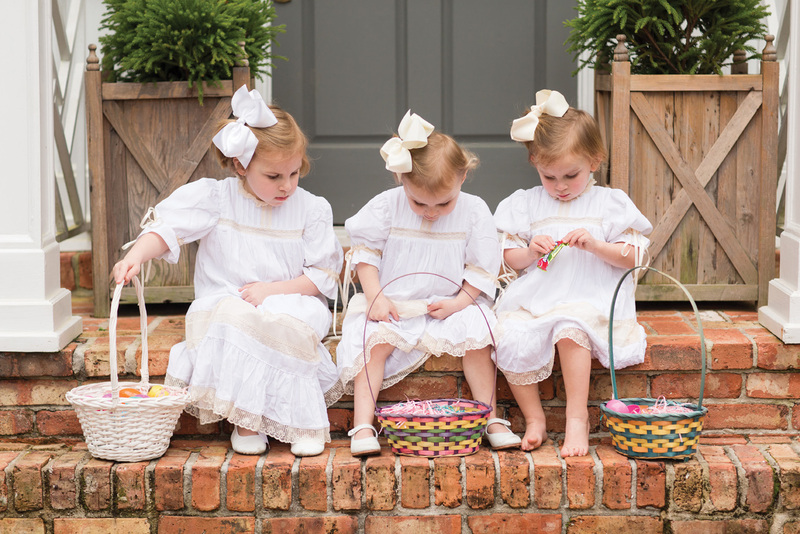 Showy azaleas, hydrangeas, lilies and tulips emerge while hatchlings chatter in nearby nests, echoing the joyous giggles of children that dash across the green lawns below. “It’s a rebirth,” Tommy Clement Jr. says of springtime in the South as it unfolds before his eyes in his own backyard. For the Clement family, the word “rebirth” means much more than just nature’s revival; it represents the handing down of Easter traditions from one generation to the next. 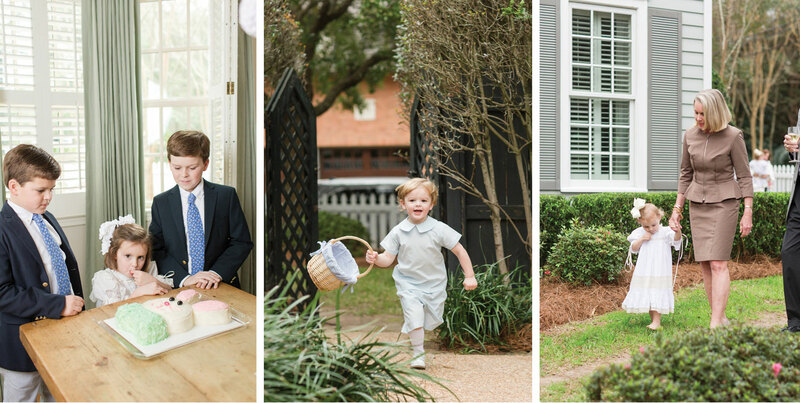 For as long as Tommy can remember, Easter — complete with egg hunt and dinner — has been celebrated at his grandmother Jackie Williams’ home. 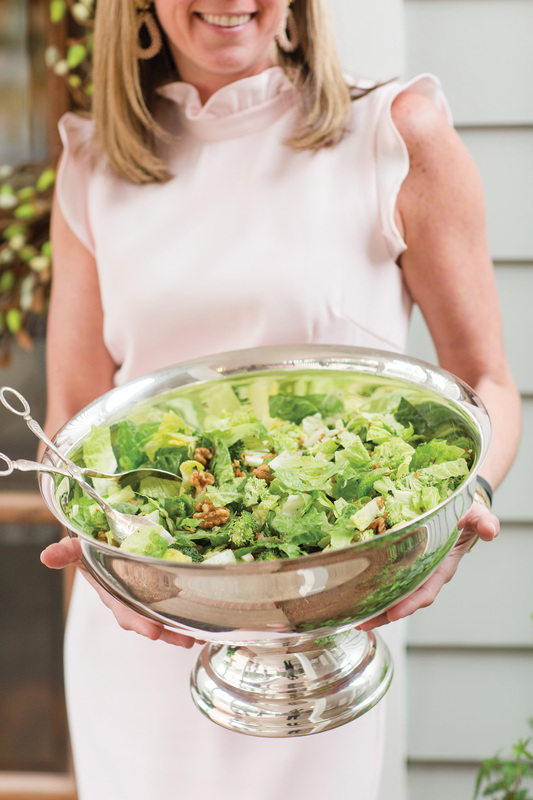 After decades worth of hosting, however, Tommy says she is about ready to “pass the baton on to us.” Eager to keep the family tradition alive, Tommy and wife Anne graciously accepted the opportunity to coordinate this year’s fete. Sisters Adele, Frances and Merril Clement compare their Easter treasures. Located on a picturesque corner in Spring Hill, an idyllic white picket fence envelops the Clements’ thoughtfully landscaped lawn. Lush shrubbery and flower-filled planters provide perfect spots to tuck eggs just out of toddlers’ sights while mature trees offer enough nooks and crannies to keep older children hunting for hours. 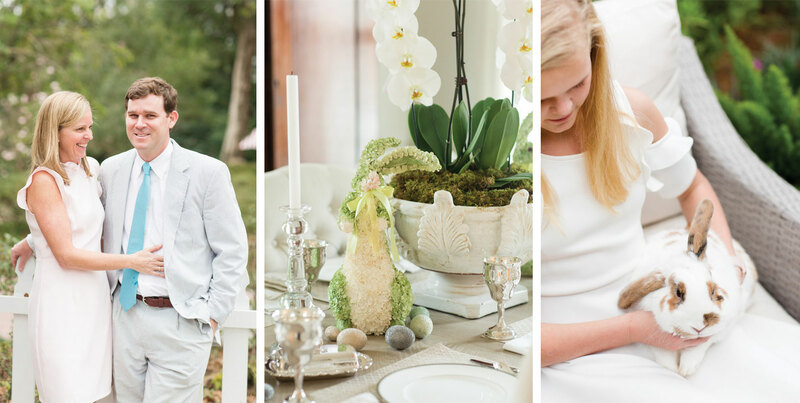 The home boasts warm and inviting gathering spots for guests of all ages, and pastel eggs, bright tulips and white porcelain bunnies dotted throughout form the subtle backdrop. As in years past, the morning starts with baskets teeming with trinkets and candy for Clement children Emme, Bond, Thompson and Mary Ellen. A traditional service at Dauphin Way United Methodist Church is next, which always includes the Clements’ favorite, a heart-stirring rendition of Handel’s “Hallelujah Chorus.” Then it is back home for pictures and an egg hunt, the most prized finds of which are the golden eggs, a tradition started by Tommy’s grandmother (she tucked $2 bills and silver dollar coins into the plastic shells). While kids turn their attention to playtime and tween talk, the men enjoy their pastime of choice — an afternoon spent watching golf and playing a raucous football game pitting kids, dads and granddads against one another. “There is always an injury,” Anne says, laughing. And the kitchen is where the group of brothers and sisters, mothers and fathers, cousins and friends gather, if only briefly, to admire the delicious meal spread before them. But before the first slice of ham is carved, the group circles together to say the blessing — a prayer for health, provision and continued traditions. Above, left to right: Thompson, Mary Ellen and Bond Clement keep watch over the sweet treats. T.C. Hamilton springs into action. Granddaughter Merril Clement hunts eggs hand-in-hand with Tommy’s mother, Lisa Clement. Skip the store-bought rolls — these scones can be prepped ahead and stored in the freezer. Just place and bake Easter morning. Recipe adapted from the former Sweet Olive Bakery in Fairhope. 2. Mix together flour, baking powder, baking soda, salt, sugar and rosemary in a large bowl. 3. Divide butter into small pieces and add to flour mixture. Using a pastry cutter or your fingertips, cut butter into the flour mixture until it resembles coarse crumbs. 4. Make a well in the center of flour and butter mixture. Gently incorporate cream into the well until dough pulls together. Turn out onto a lightly floured table and form into a 1-inch thick round. Cut with a biscuit cutter. 6. Before baking, brush the tops of scones with egg wash. Bake 25 – 30 minutes or until golden brown. 7. 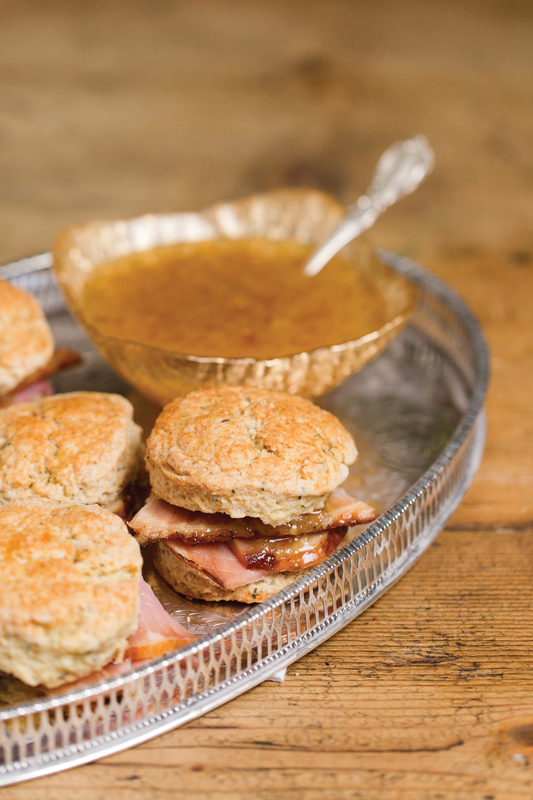 Add baked ham bites and a dollop of Jezebel Sauce (below) to each sliced scone. Just like Southern women, this classic sauce is sweet with a little spice. 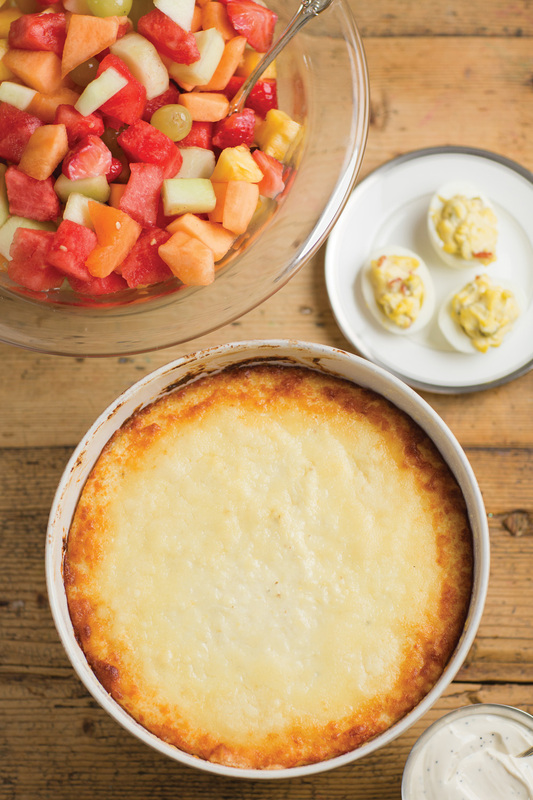 Recipe adapted from “Some Like It South,” a cookbook by the Junior League of Pensacola, Florida. Recipe adapted from “Come On In,” a cookbook by the Junior League of Jackson, Mississippi. 1. Melt butter in a saucepan over medium heat. Brown walnuts and noodles in butter; cool on paper towels. 2. Combine noodles and walnuts with broccoli, lettuce and onions. Pour dressing over and toss to coat well. Serves 10. 1. Blend all ingredients well, and serve with chilled salad. Yields 2 1/2 cups. Gruyere and Parmesan give this Southern dish a unique taste. The recipe can be prepared the day before and baked when ready to serve. Recipe adapted from a cookbook by the Junior League of Memphis, Tennessee. 2. Bring milk to a boil. Add 1/2 cup butter and stir in grits. Cook, stirring constantly, until mixture is the consistency of oatmeal (about 5 minutes). 3. Remove grits from heat, add salt and pepper and beat mixture well. 4. Stir in remaining 1/3 cup butter and Gruyere, and pour into a greased 2-quart casserole dish. Sprinkle with Parmesan. 5. Bake 1 hour and serve warm. Serves 10. 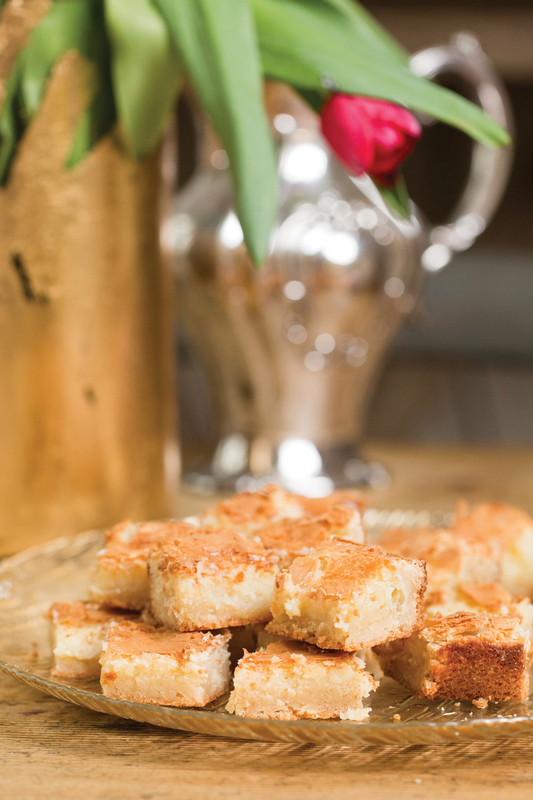 This quick and easy Southern staple is dear to Anne Clement’s heart, as the recipe was handed down from her grandmother. 1. Boil noodles according to package directions. Pour half of the noodles into a 9-inch by 12-inch casserole dish and cover with half of cheese. Add remaining noodles to cheese layer, then top with remaining cheese. 2. Top noodles with enough milk to nearly cover entirely. Top with butter, salt and pepper. 3. Cook at 350 degrees for 45 minutes – 1 hour, until lightly brown on top. Serves 10. These creamy bites are the perfect “pick up” dessert. Recipe courtesy of Betty Luce, as found in “One of a Kind,” a cookbook by the Junior League of Mobile. 2. In a medium bowl, combine cake mix, egg, butter and vanilla. Spread into a greased 9-inch by 13-inch pan. 3. In a clean bowl, beat eggs, cream cheese and sugar. Pour on top of cake mixture and bake 30 – 40 minutes. Cool and cut into bars. Yields 24 bars. A surprisingly strong drink that can waylay the best of intentions, as the name reminds. 1. Fill blender with ice. Add limeade, vodka and mint leaves. Blend until mint leaves are finely chopped. 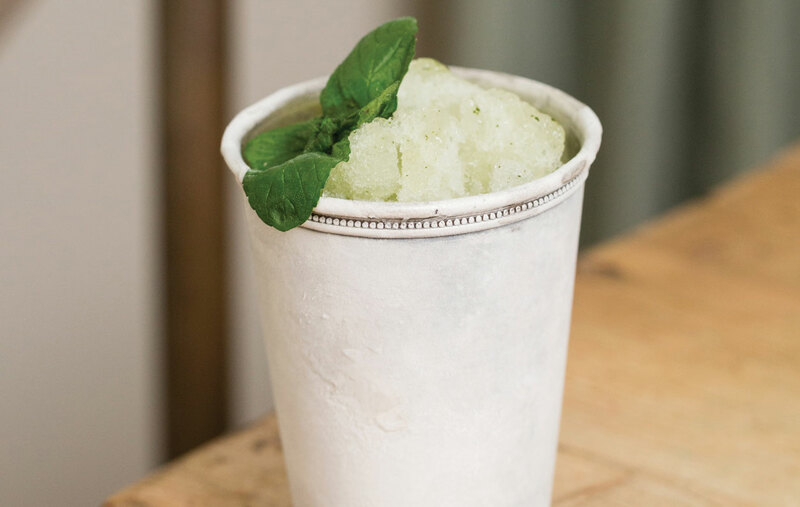 Serve in glasses garnished with fresh mint sprigs. Serves 4.